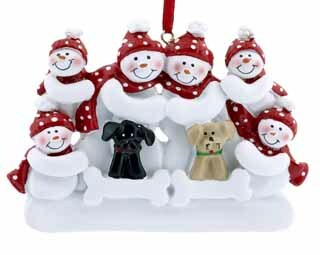 Order dog Christmas ornaments online in a variety of styles featuring over 100 different breeds! Introducing this year's trendiest Christmas ball ornaments! 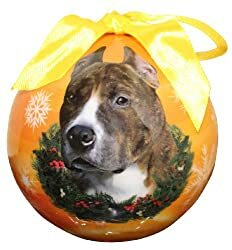 These Pit Bull ornaments are measuring 3 inches in diameter and come equipped with the most convenient feature: they're SHATTER PROOF! If your furry friend decides to climb the tree or runs past it a little too quickly, don't worry; these ornaments won't break into little pieces all over your floor like other ball ornaments would. Each and every Dog Breed Christmas ball is designed to perfection with a realistic hand crafted picture of your favorite pets. We are currently the only company manufacturing these shatter proof ball ornaments and can guarantee it'll be the best and most durable Christmas item in your home for years to come. These ornaments are also easy to personalize with a sharpie, adding that do it yourself feel for that extra special touch! These are also great for gift giving. Each ornament comes packaged in a Christmas decorated box surrounded by Christmas sayings with each dog face showing through the front like a picture frame. Shatter proof Christmas ball ornaments are irresistible at this great price and quality. Your puppy will be delighted with this addition to your tree. Our personalized dog Christmas ornament is the perfect ornament to get for your pampered pet! The ornament spells out WOOF. The happy dog is peeking through the letter O. He is so happy because he has his chew rope, ball, newspaper and shoe to chew on! This is a fun ornament to get for your dog, your dog sitter or dog groomer. We can write a name on it for you! This family of six is happy to be a family of eight with the addition of their two dogs!This is a wonderful gift to give to a family ofsix who have a black dog and a tan dog. They will be so surprised you foundthem the perfect ornament to display on their tree! The smiling snow family is wearing matching hats and scarves and each of the dogs have his or her own bone! This makes a wonderful gift! This family of five loves to play in the snow with their two dogs. They are wearing matching red and white hats and scarves. They have a black dog and a tan dog. Each dog is sitting in front of his or her own bone. This is a very unique ornament to give as a gift to a family of five who have a tan dog and a black dog. They will love the sentiment and willl be surprised that you found them the perfect ornament that includes the dogs in their family! This snow family of four is very happy to spend time in the snow with their two dogs. This family is dressed in matching redhats and scarves with white polka dots. They have a tan dog and a black dog. Each dog is sitting in front of his or her own bone. This is a very unique ornament to give to a family of four who have a tan dog and a black dog. The family will be so happy to display this on their tree especially since it has the dog members of their family on it! This family of three is very lucky to have two adorable dogs in their family. The child is happy he has two playmates that are always ready to play with him. He is lucky to have playmates to play with him anytime he wants. This family of three are the lucky owners of two dogs. This ornament is a great way to celebrate the addition of a new dog to the family! Our pets are members of our families. When we lose a loved one in our family, we commemorate our love for them withmeaningful keepsakes. Let this special personalized pet memorial ornament be a keepsake to remember the life of your dog or other special pet. This ornament permanently says I WILL SEE YOU WHEN I GET TO HEAVEN. It is in the shape of a heart. There is a paw printwith angel wings at the top. We can write the name of your pet and a year if you would like. A sentimental gift for a family who has recently lost a favorite pet. Do you love dogs? This personalized dog lover ornament has a bowl filled with bones that can all be personalized with a dog's name on them to celebrate a new litter or you can personalize just the banner at the bottom for one dog and leave the bones in the bowl blank. The choice is yours! Makes a great gift for a person who has a lot of pet dogs, puppies or rescues dogs from the dangerous streets to get them into loving homes. Everyone knows that the king of the house is your pet dog! This personalized crown ornament is blue and white, dazzling with glitter and a blue jewel on the top. This ornament permanently says KING OF THE HOUSE underneath the crown and we can personalize the white dog bone with the name of your pet pooch, who is a loyal friend and member of the family. Dangling from the dog bone is a white dog house with blue roof and tiny blue heart above the door. A personalized dog ornament makes a perfect gift for a family with a pet dog or for anyone giving a pet dog for Christmas as a keepsake of this special moment. A little boy who loves fire truckshas to havethis personalized fire truck ornament! Your pretend little firefighter will love the cute dalmation dog driving the truck. He has hisfire hose and ladder and is ready to put out the fire!Wecan write a name and year on this ornament for you. This also can be a gift for a firefighter, or a firefighter in training. Give this as a gift to your local fire department.The firemen will look forward to hanging it on the fire stationtree year after year! 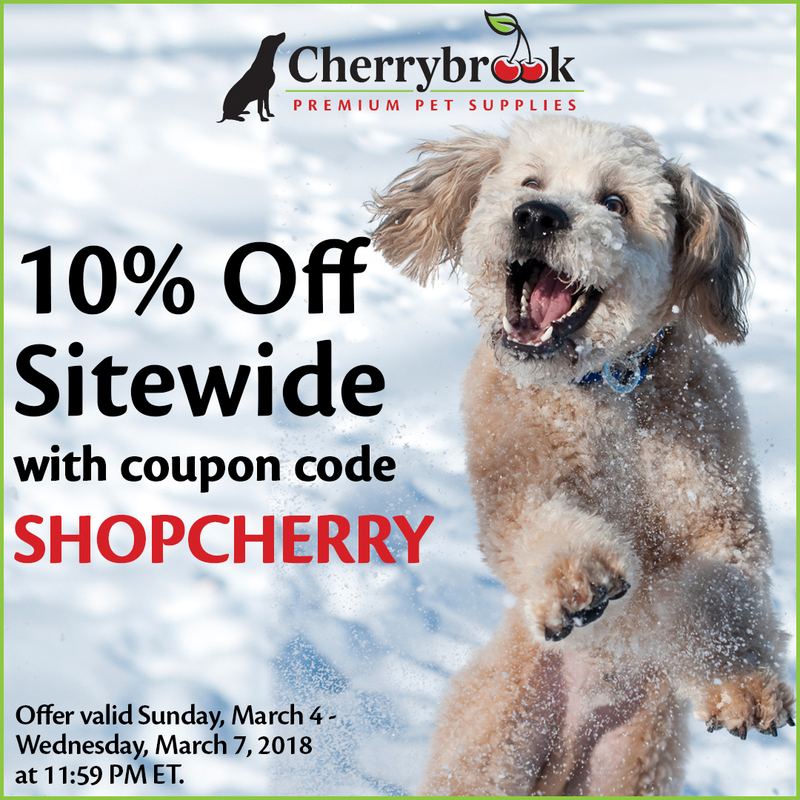 Do you love to pamper your dog? This personalized dog ornament is too dog gone cute for words!We can write the name of your favorite dog on thedog bone. DOG-GONE CUTE is permanently printed on the heart dangling from the bone. A bow with little paw printson it is on top of the bone.Your dog will like to have his or her own ornament on the tree! This is a great gift for a dog lover, a dog walker or a veterinarian. A dog isn’t just a man’s best friend; it’s a woman’s best friend too! Keep this adorable little pooch for yourself when you display this doggie stocking Christmas ornament on your tree. For all the dog lovers out there, this puppy ornament makes an excellent gift. Featuring a happy pup wearing a Santa hat and sticking his head out of a red stocking trimmed in green glitter, this Christmas pooch ornament is as cute as it gets this season. A pet dog isn't just man's best friend but a member of the family! 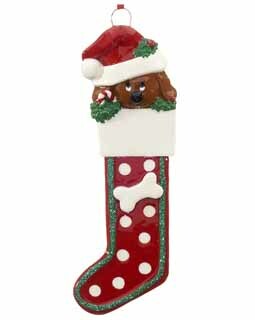 Display this doggie stocking Christmas ornament on your tree as a reminder to get some dog bones or bacon treats for your furry friend who deserves a special snack on Christmas. For all the dog lovers out there, this puppy ornament makes an excellent gift, especially for a family who just got a new dog for Christmas. Featuring a happy pup wearing a Santa hat and sticking his head out of a red stocking trimmed in green glitter, this personalized dog ornament is as cute as it gets this season. Witha brand new puppy in the house, it's going to be a Ruff Christmas! This super cute personalizedwhite dog ornament is the perfect gift for your pet dog! Make sure that your favorite new member of the family has a place on the Christmas tree with this personalized dog ornament that shows awhite dog wearing a red stocking hat andchomping onan oversized dog bone in his mouth. We can personalize the red hat with your pet doggie's name and the dog bone with your favorite saying, holiday greeting or message to your pet pooch. 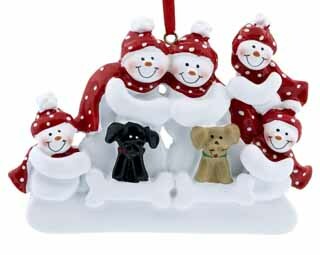 This personalized dog ornament makes a great gift for a family thatadded a newwhite puppy in their home this Christmas! I woof you! This super cute personalizedtan dog ornament is the perfect gift for your pet dog! Make sure that your favorite loyal member of the family has a place on the Christmas tree with this personalized dog ornament that depicts a tan dog wearing a red stocking hat, holding an oversized dog bone in her mouth. We can personalize the hat with your pet pooch's name and the dog bone with a message to your pet doggie, favorite holiday greeting or wish your pet puppy a MERRY 1st CHRISTMAS. This personalized dog ornament makes a great gift for a family that has a newtan puppy in their home this Christmas that they rescued from an animal shelter! Bow wow! This super cute personalized black dog ornament is the perfect gift for your pet dog! Make sure that your favorite loyal member of the family has a place on the Christmas tree with this personalized dog ornament that shows a black dog wearing a red stocking hat, holding an oversized dog bone in his mouth. We can personalize the hat with your pet pooch's name and the dog bone with your favorite saying, holiday greeting or message to your pet doggie. This personalized dog ornament makes a great gift for a family that has a new black puppy in their home this Christmas! A wonderful keepsake to remember your pet pooch when you are decorating your Christmas tree, this personalized dog ornament will make you smile. It has a brown dog with black floppy ears wearing a red and white checkerboard bow around its neck, hugging a Christmas tree containing peppermint candy and dog bone ornaments. The tree is topped with a bright yellow star. The personalization area at the botom has two tiny red hearts. Makes a great gift for a family who has a pet dog. Have atail waggingChristmas this year with this personalized dog stocking that can be embroidered with your pet dog's name. This adorable stocking for your newpuppy or precious petdog has a whimsical face and wears a red stocking Santa hat with sprig of holly on it and warm knit red scarf around its neck. Makes a great gift for a family that just adopted adog from an animal shelter or has a mutt breed of dog that they brought into their home. We have acat stocking too! Just type GA15014 into our search box to see it! Sold separately. This playful pup searches for his bone, but he found your stocking instead! 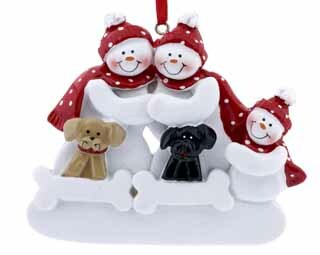 Get this personalized white dog ornamentto representyour fluffy furrball pet dog on the Christmas tree. Tucked into a red Christmas stocking, this personalized white puppy ornament has a red and white striped candy cane hanging out of the stocking and a round green, red and white striped lollipop in the back. Get a personalized dog ornament for anyone on your shopping list that loves their pet and loves to rescue dogs from the shelter for the holidays. It doesn’t matter what breed your dog is because he is one-of-a-kind with his unique personality. You are going to love this personalized tan dog ornament that has your family dog sitting in a red Christmas stocking filled with lollipops and candy canes. This personalized tan puppy ornament makes a great gift fora family that adopted a dog from the shelter this year or got a new puppy for Christmas. The white part of the top of the stocking can be personalized with the unique dog name that you christened your puppy with. Hang a personalized dog ornament on your Christmas tree to let everyone know that your dog isn't just a pet, but is a member of the family. This new puppy might need some training, or all of your socks and shoes will become easy targets! This personalized black dog ornament is an adorable keepsake to remember man's best friend on your Christmas tree. Peeking out from his Christmas stocking next to a red and white striped candy cane, this personalized black puppy ornament isa great gift for anyone who got a puppy for Christmas or adopted a dog from a shelter for the holidays. The top of the stocking can be personalized with your dog's unique name. A white dog that is cuddly is just what you always wanted, and now that she is part of the family, she needs an ornament on the tree too! Personalize this dog biscuit with your pet dog's name for a keepsake on your Christmas tree that will be memorable for years to come. This white dog is like a playful puppy that causes a lot of mischief in your home, and is pictured dangling from an oversized dog biscuit. Makes a memorable gift for anyone with a white dog for a pet. There are so many dog breeds that produce tan or brown colored dogs that this ornament can work for any of them. Hanging from an oversized dog bone, this playful puppy has been a wonderful addition to your family. We can personalize the dog bone with the name of your dog or a nickname that you have for your favorite pet. The kids will love hanging this keepsake on the tree because they will all want their pet puppy to be represented on the tree. Anyone who has adopted a dog from an animal shelter will love this personalized dog ornament. This playful black puppy can't get enough of your slippers or the morning newspaper. You will love this personalized black dog ornament that has your playful puppy dangling from an oversized dog bone with a holly leaf in the corner. Make sure that you include your pet dog when it comes to your tree decorating with this fun dog ornament. Give this to someone who adopted a dog or a family who loves their pet dog like a member of the family. Do you have a dog that is treated like royalty? Then we have the perfect ornament for him or her! Our personalized dog crown ornamentis fit forthe king or queen of the doghouse! A silver dog paw print is on the middle of the crown. A dog collar with red hearts is secured around the bottom of the crown. A white dog bone is hanging from the crown. This bone can be personalized with his majesty's or her majesty's name! Your pampered pup will love to have their very own ornament hangingon the family tree! This is a fun ornament to give to someone who has recently welcomed home a new puppy, or to a veterinarian who treats your dog with supremacy! A wonderful keepsake for the addition of a puppy to your family for Christmas. Pet dogsleave paw prints on our heart is what this festive holiday candy cane signifies for a dog lover or pet puppy owner. The red and white striped dog candy cane is decorated with a red glittered bow and four black paw printsare stamped alongthe candy cane. This personalized dog ornament has a white bone that has room for your pet pooch's name. Anyone with a best friend pet dog, new puppy or rescue dog will love having this keepsake on the tree to remind them that pets give unconditional love! The roof of this personalized dog house ornament is lined with dog bones! Give this fun personalized doghouse ornament to anyone who is a dog lover or just received a new pet dog for Christmas! The heart is outlined with a stitching pattern and can be personalized with a special message or date you rescued a puppy from the animal shelter. The green holly leaves are coated in glitter for a pretty festive look and the large dog bone at the bottom has enough room to prominently display your loyal four-legged friend's name! This personalized dog ornament is a must for anyone who just built their pup a home! The difference between friends and pets is that friends we allow into our company, pets we allow into our solitude. For a dog that can always make you smile, even after a hectic day at the office. 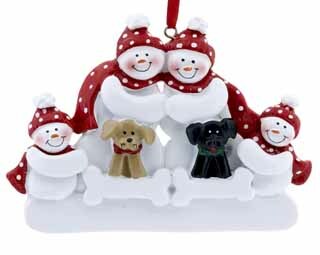 This adorable dog ornament has a dark brown dog desperately clinging to a white dog bone, a holly leaf with berries in the corner. Personalize the dog bone with a name of your dog or give this as a gift to a friend who recently rescued a puppy from the animal shelter. This pet ornament also makes a great gift for a dog lover! This bright red glass ball personalized pet ornament permanently says BEST FRIENDS FUR-EVER on it and has the letters BFF inside of the paw print. Paws-itively adorable, this paw print ornament can represent any of your furry pets or friends such as dogs, cats, hamsters, gerbils, guinea pigs and other pet mammals. This fun personalized pet ornament is ideal for families with both cats and dogs or any combination of animals in their home. With this ornament, everyone, including all of your pets, can be a part of the family tree for Christmas! Yourpet dog isman's best friend,trotting down the drivewayto pick up the Sunday paper for you and has stopped eating your slippers, which shows your little puppy is growing up. Celebrate the relationship between you and your dog with a personalized dog ornament that permanently says BEST FRIEND in the red heart stamped in gold letters. We can personalize the personalized dog bone ornament with your dog's name that proudly displays your relationship on your Christmas tree. Select from site menu at top right for more ornament designs featuring specific dog breeds.